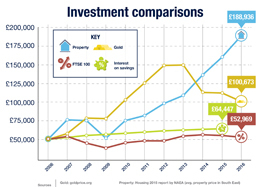 Property has been named as the most lucrative investment in the UK over the last decade, delivering a significantly larger return than alternative options including the stock market, gold and savings accounts. New research by estate agents and sister companies Leaders and Romans compared the return an investor would have enjoyed in each of the four markets had they invested an initial £50,000 in 2006. It showed the buy-to-let market has generated a 175 per cent return over the last ten years, equating to a profit of £138,936. In comparison, gold has delivered a profit of £50,673, interest on savings accounts was worth £14,447 and a £50,000 investment in the FTSE 100 has yielded just £2,969 over the same time. Allison Thompson, managing director at Leaders, says: “Buy-to-let performs significantly better than other investments in terms of an overall return. Our research shows a buy-to-let investor in 2006 would be almost £90,000 better off today than somebody who invested in gold and more than £135,000 up on somebody who bought stocks and shares. Whilst gold, stocks and shares and savings offer greater liquidity than property, which can take several weeks to buy or sell, this does not deter shrewd investors who value the dual benefits of an immediate monthly rental income and capital appreciation over time. Allison adds: “Despite many changes over the last ten years to the housing market and wider economy, buy-to-let is still the clear winner. As well as the most rewarding, it is also the safest of all the investment options over the long term. We have seen historically that, although cyclical, house prices always rise in the long run. With the acute shortage of housing across the UK, this is only likely to continue. To help investors identify the best buy-to-let opportunities, Leaders and Romans have launched a new online hub which brings together the largest choice of buy-to-let properties available across the country. “Extracting maximum value from a buy-to-let property at all times is crucial in achieving the best return,” explains Allison Thompson, “but perhaps the greatest gains can be made when buying and selling. Our new Property Investment Hub helps investors by giving them instant access to the best opportunities on the market across the country. “Every house or apartment featured has been assessed and valued by a local Leaders or Romans expert and is predicted to deliver either a very a good rental yield, strong capital growth or a combination of the two. Most provide a rental yield of at least four per cent, but some properties with slightly lower yields have been included where capital growth potential is exceptionally good. “All properties featured on the hub are in areas where rental demand is consistently high and predicted to remain high. Many of them are currently let and managed by Leaders or Romans and come with a detailed rental history and a reliable tenant in situ so investors can buy with extreme confidence. To view an extensive range of buy-to-let properties that have been hand-picked for their outstanding investment potential visit Property Investment Hub. For advice on buying to let to meet your investment goals contact your local Leaders branch.